Helsinki hockey club Jokerit’s move to the KHL brought them into direct competition with their part-owners’ other team, SKA Saint Petersburg. 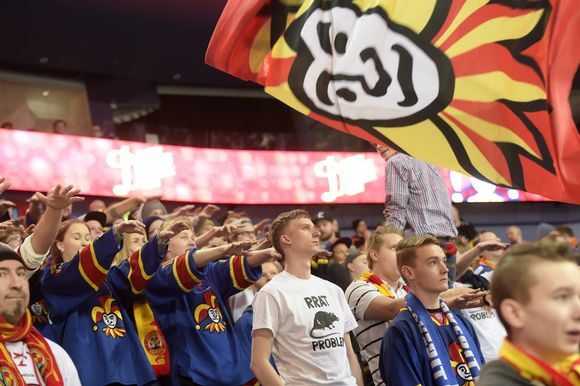 Jokerit fans have been somewhat sceptical about the ownership—and they are now in open revolt thanks partly to a supposed mix-up over goal music. When Jokerit’s owners sold their home arena and 49 percent of the club itself to Russian investors, they also moved to play in Russia’s Kontinental Hockey League (KHL). Harry Harkimo retained a 51 percent stake in Jokerit. The new owners—Gennady Timchenko, Boris Rotenberg and Roman Rotenberg—also have an interest in SKA Saint Petersburg, and this season that apparent conflict has become a bone of contention for Jokerit supporters. First Jokerit traded the rights to their forward Steve Moses to SKA in November. Moses had been a key player for Jokerit in 2014-15 before heading back to play in the American Hockey League (AHL) in the first part of this season. Then on 16 February Jokerit’s home arena rang out to the sounds of SKA’s goal music during a 3-1 win for Jokerit over their nearest KHL rivals. That resulted in the suspension of the club’s DJ, Amanda Harkimo (daughter of long-time Jokerit owner Harkimo), who said Roman Rotenberg had previously asked for the goal music to be played, and the arena’s ‘stage manager’ had repeated the request before the SKA game. This apparently trivial matter played into ongoing discussions about Jokerit’s finances and funding that reportedly mean the club is seeking new ownership to help fund the club’s staggering losses. The fans, meanwhile, organised a protest for the next home game. They painted a banner that read 'RRat Problem', but when stewards moved in to remove the banners the fans left their end empty for two periods of the match against Dinamo Moscow. The club claimed KHL rules forbid any kind of protest, and indeed Jokerit have been fined over the incident. The banner was a reference to Roman Rotenberg, the younger part-owner who grew up in Helsinki in the 1990s but now helps market SKA--another club he part-owns. Mikko Saksanen of the Eteläpääty supporters group says that fans have sought and received reassurances about Rotenberg's role for two years now, but suspicions remain. Fans have been upset about the sale of SKA merchandise at matches, about cyrillic script on club merchandise, and of course about the goal music 'scandal'. Now, Saksanen says, the club is responding to their concerns. "It's important for us to start a discussion, and thankfully we've got that," Saksanen told the YleX radio station. "Jokerit has answered our questions quite well recently." But with Jokerit riding high in the league, and progressing well in the play-offs, what more do the fans want from their owners? The current Russian ownership foots the bill for a very competitive team, and the club admits it lost 'millions' of euros in its first KHL season. The holding company has not yet filed accounts for the financial year ending in April 2015--even though Finnish company law says the accounts should be filed within two months of the end of the financial year. "The ideal would be that we'd have wholly Finnish ownership and nobody would have a double role," said Saksanen. "On the other hand we understand that the KHL is a big league where you need a lot of money. Where would the money come from then, I don't know." If Jokerit make it to the Conference Finals, they could well face SKA. Roman Rotenberg has told the press that he believes there's no problem with that, but the fans might well see things differently.